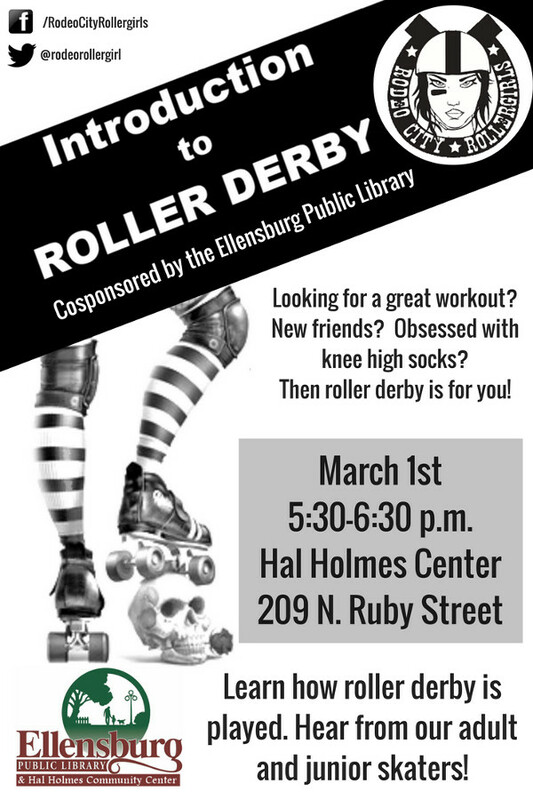 Rodeo City Rollergirls host an Introduction to Roller Derby, cosponsored by the Ellensburg Public Library! Join us for a presentation on Roller Derby, and hear from our adult and junior skaters. This will be great for anyone who is interested in learning more about the subject, becoming a fan, or joining our league. It really is for everyone, we are always looking for volunteers for our events, including skaters, referees, & non-skating officials. Plus, we will be giving away free stuff! You could walk away with tickets to our next home bout on March 5th, or some cool Rodeo City Rollergirls merchandise! Can’t Wait?! Can’t Make it?! If you have any questions, or want to get involved with us, check out this page for more info —> Join Us!